Sir Barry Alan Crompton Gibb, CBE (born 1 September 1946) is an English singer, songwriter, musician and record producer who rose to worldwide fame as a co-founder of the group the Bee Gees, one of the most commercially successful and critically acclaimed groups in the history of popular music. With his younger brothers, twins Robin and Maurice Gibb, he formed a songwriting partnership beginning in 1966. Born in Douglas on the Isle of Man, he was raised in Manchester where he became involved in the skiffle craze, forming his first band, the Rattlesnakes, which evolved into the Bee Gees in 1960 after they had moved to Redcliffe, Queensland, Australia. They returned to England where they achieved worldwide fame. Well known for his wide vocal range, Gibb's most notable vocal trait is a far-reaching high-pitched falsetto. 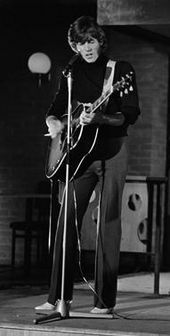 Gibb shares the record with John Lennon and Paul McCartney for consecutive Billboard Hot 100 number ones as a writer with six. Guinness World Records lists Gibb as the second most successful songwriter in history behind Paul McCartney. Gibb's career has spanned over sixty years. In 1994, he was inducted into the Songwriters Hall of Fame with his brothers. In 1997, as a member of the Bee Gees, he was inducted into the Rock and Roll Hall of Fame and received the Brit Award for Outstanding Contribution to Music. Barry is a fellow of the British Academy of Songwriters, Composers and Authors. In 2007, Q magazine ranked him number 38 on its list of the "100 Greatest Singers". During 1976, Gibb met with Vince Melouney and wrote two songs, "Let It Ride" and "Morning Rain", that were never recorded. In November 1977, the film Saturday Night Fever was released and its soundtrack became the best-selling soundtrack of all time. During 1977, Gibb co-wrote "Emotion", the song remains Samantha Sang's best-known hit. Gibb and Galuten wrote "Save Me, Save Me" originally recorded by the group Network and later covered by Frankie Valli, Dusty Springfield, Rare Earth, and Teri DeSario. The film Sgt. Pepper's Lonely Hearts Club Band, featuring Gibb as Mark Henderson was shown in July 1978. Andy's third single, "Shadow Dancing", which was credited to all four Gibb brothers, was also a US No. 1 single. In 1978, Gibb wrote a title song to order for their manager Robert Stigwood's film and stage musical Grease and was later recorded by singer Frankie Valli and reached No. 1 in the US. The song contains guitar work by Peter Frampton. In February 1978, he provided background vocals for his composition "Ain't Nothing Gonna Keep Me From You" which featured Teri DeSario on vocals. After the Bee Gees' successful 1979 Spirits Having Flown Tour to promote the album of the same name, he produced and almost wrote all of the songs on Andy Gibb's final album, After Dark, released at the start of 1980. On 27 January 2014, Gibb appeared on the American television show Late Night with Jimmy Fallon to announce the start of his first solo tour of the US. He performed "You Should Be Dancing" with help from Fallon's backing band, The Roots. Gibb and Fallon sang some Everly Brothers songs, including "Bye Bye Love" and "Wake Up Little Susie". Gibb also sang "To Love Somebody" as a bonus online performance. On 28 January, Gibb was interviewed by the CNN about his brothers and, in that same interview, Gibb talks about Justin Bieber, saying he is "heading for a brick wall". In a Mirror interview with Gibb on 11 July 2014 that he was still mourning following the death of Robin and credits his wife Linda and Paul McCartney for helping him to recover. Gibb appeared on a McCartney tribute album, The Art of McCartney, released on 18 November 2014 performing "When I'm Sixty-Four". Gibb's friend, country singer TG Sheppard said in an interview with Gary James that Gibb just moved to Nashville and was going into country music. On 8 February 2015 at the 57th Annual Grammy Awards, Gibb, along with the group Pentatonix, presented the category of Best Pop Vocal Album. On 26 March 2015, Gibb was one of the headlining acts on a music festival called the Hard Rock Rising Miami Beach Global Music Festival alongside Andrea Bocelli, Gloria Estefan, Flo Rida, Jon Secada and Wyclef Jean. For the first time in public, he performed his new song "The Home Truth Song". Gibb's first marriage was to Maureen Bates, whom he married on 22 August 1966 when he was 19 years old. The couple lived together for only a short time and were divorced in July 1970. During the taping of the BBC's Top of the Pops in London, Gibb met the former Miss Edinburgh, Linda Gray. On 1 September 1970 (his 24th birthday), Gibb married Gray. Together, they have five children – Stephen (born 1973), Ashley (born 1977), Travis (born 1981), Michael (born 1984) and Alexandra (born 1991) – and seven grandchildren. Gibb also became friends with Michael Jackson, as he mentions him in his 11 July 2014 interview with the Mirror: "He would come to Miami and stay in our house. He’d sit in the kitchen and watch the fans outside his hotel on TV, just giggling – 'Hee hee!' He lived upstairs for a while, right before his child-molestation trial. We never discussed the case. We would just sit around and write and get drunk. Michael liked wine – there were a few nights when he just went to sleep on the floor", adding that he misses Jackson. Michael Jackson was godfather to Gibb's son, Michael. In January 2006, Gibb purchased the former home of country singers Johnny Cash and June Carter Cash (the House of Cash) in Hendersonville, Tennessee, intending to restore it and turn it into a songwriting retreat. The house was destroyed by fire on 10 April 2007 while under renovation. On 10 July 2009, Gibb was made a Freeman of the Borough of Douglas (Isle of Man). The award was also bestowed upon his brother Robin and posthumously upon his brother Maurice. Also in 2009, Gibb and his wife became US citizens. They have dual citizenship. Gibb has homes in Miami, Florida, and Beaconsfield, Buckinghamshire, set in 90 acres of countryside. ^ Summers, Kim. "Barry Gibb Biography". AllMusic. Rovi Corporation. Retrieved 5 June 2013. ^ "Barry Gibb Biography". Bio. Retrieved 5 June 2013. ^ Summers, Kim. "Robin Gibb". Allrovi. Archived from the original on 19 May 2012. Retrieved 20 May 2012. ^ Thompson, Gayle (26 September 2012). "Ricky Skaggs Draws Barry Gibb Into Country Music". The Boot. Retrieved 31 March 2015. ^ Smith, Steve. "First Abba song in 18 years and Hollywood honors McCartney". SGVTribune.com. Archived from the original on 25 May 2012. Retrieved 16 April 2012. ^ a b "Fellows – The British Academy of Songwriters, Composers and Authors". Basca.org.uk. Retrieved 27 September 2014. ^ "Q Lists". Rocklist.net. Retrieved 20 February 2015. ^ "No. 56430". The London Gazette (Supplement). 31 December 2001. p. 23. ^ a b c Melinda Bilyeu; Hector Cook; Andrew Môn Hughes. The Bee Gees. Retrieved 10 March 2015. ^ "Featured Articles – Robin Gibb". TheGenealogist.co.uk. 22 December 1949. Retrieved 23 September 2012. ^ a b c d e f g h i j k l Hughes, Andrew (2009). The Bee Gees – Tales of the Brothers Gibb. Omnibus Press. ISBN 9780857120045. ^ "10 pound Pom arrival lists go online". Perth Now. Archived from the original on 1 December 2014. Retrieved 1 December 2014. ^ Brennan, Joseph. "Gibb Songs: 1946–1962". Retrieved 1 December 2014. ^ Brennan, Joseph. "Gibb Songs: 1966". Retrieved 1 December 2014. ^ Nimmervoll, Ed. "Jimmy Little". Howlspace – The Living History of Our Music. White Room Electronic Publishing Pty Ltd. Archived from the original on 27 July 2012. Retrieved 10 March 2015. ^ McFarlane, Ian (1999). Encyclopedia of Australian Rock and Pop. Archived from the original on 30 September 2004. Retrieved 10 March 2015. ^ Brennan, Joseph. "Gibb Songs: 1964". Retrieved 1 December 2014. ^ "Billboard: Thorpe Gets Aussie Award". Billboard: 66. 13 August 1966. Retrieved 13 March 2015. ^ "From the Music Capitals of the World". 27 August 1966: 50. Retrieved 13 March 2015. ^ "Bryan Davies – Love and Money". 45cat. Retrieved 31 March 2015. ^ Brennan, Joseph. "Gibb Songs: 1967". Retrieved 30 December 2013. ^ Eells, Josh (4 July 2014). "Barry Gibb: The Last Brother". Rolling Stone. Retrieved 10 March 2015. ^ WENN (6 December 2010). "Bee Gees – Gibb Still Cherishes First Lennon Meeting In Exclusive Club". contactmusic.com. Retrieved 10 March 2015. ^ Bianculli, David. Dangerously Funny: The Uncensored Story of "The Smothers Brothers Comedy Hour". Retrieved 13 March 2015. ^ "Monkee Parties". psycho-jello.com. Retrieved 10 March 2015. ^ "Samantha Sang – The Love of a Woman / Don't Let It Happen Again". 45cat. Retrieved 11 March 2015. ^ "P.P. Arnold – Bury Me Down By The River / Give A Hand, Take A Hand". 45cat. Retrieved 11 March 2015. ^ Brennan, Joseph. "Gibb Songs: 1969". Retrieved 2 December 2014. ^ "Barry Gibb – The Kid's No Good (Isle of Man release)". Discogs. Retrieved 22 February 2015. ^ "Barry Gibb – The Kid's No Good (Hong Kong release)". Discogs. Retrieved 22 February 2015. ^ "Barry Gibb – I'll Kiss Your Memory". dutchcharts.com. Retrieved 22 February 2015. ^ Eder, Bruce. "The Kid's No Good – Barry Gibb". AllMusic. Rovi Corporation. Retrieved 11 March 2015. ^ a b c Brennan, Joseph. "Gibb Songs: 1970". Retrieved 30 December 2013. ^ "45 discography for ATCO Records". Globaldogproductions. Retrieved 1 January 2014. ^ "ONE BAD THING RONNIE BURNS BARRY GIBB/BEE GEES. B CADD". popsike.com. Retrieved 11 March 2015. ^ "Barry Gibb – King Kathy". Discogs. Retrieved 30 December 2013. ^ Brennan, Joseph. "Gibb Songs: 1972". Retrieved 31 December 2013. ^ Brennan, Joseph. "Gibb Songs: 1973". Retrieved 31 December 2013. ^ Brennan, Joseph. "Gibb Songs: 1974". Retrieved 31 December 2013. ^ "Bee Gees – Nights on Broadway Songfacts". Songfacts. Retrieved 30 December 2013. ^ a b Brennan, Joseph. "Gibb Songs: 1976". Retrieved 23 April 2013. ^ "Songwriters Hall of Fame – Barry Gibb". songwritershalloffame.org. Archived from the original on 3 April 2015. Retrieved 31 March 2015. ^ "Network – Save Me, Save Me". Discogs. Retrieved 13 March 2015. ^ "Frankie Valli – Save Me, Save Me". 45cat. Retrieved 31 March 2015. ^ "Dusty Springfield – Living Without Your Love". Discogs. Retrieved 31 March 2015. ^ "Rare Earth – The Best of Rare Earth". Discogs. Retrieved 31 March 2015. ^ "Teri De Sario – Pleasure Train". Discogs. Retrieved 31 March 2015. ^ Brennan, Joseph. "Gibb Songs: 1977". Retrieved 23 April 2013. ^ Brennan, Joseph. "Gibb Songs: 1980". Retrieved 31 December 2013. ^ Brennan, Joseph. "Gibb Songs: 1982". Retrieved 31 December 2013. ^ Cardwell, Nancy. The Words and Music of Dolly Parton. Retrieved 13 March 2015. ^ Brennan, Joseph. "Gibb Songs: 1983". Retrieved 31 December 2013. ^ Brennan, Joseph. "Gibb Songs: 1984". Retrieved 31 December 2013. ^ Brennan, Joseph. "Gibb Songs: 1985". Retrieved 31 December 2013. ^ Brennan, Joseph. "Gibb Songs: 1986". Retrieved 31 December 2013. ^ Brennan, Joseph. "Gibb Songs: 1987". Retrieved 31 December 2013. ^ Brennan, Joseph. "Gibb Songs: 1988". Retrieved 31 December 2013. ^ Brennan, Joseph. "Gibb Songs: 1990". Retrieved 17 April 2013. ^ Brennan, Joseph. "Gibb Songs: 1992". Retrieved 17 April 2013. ^ Brennan, Joseph. "Gibb Songs: 1993". Retrieved 17 April 2013. ^ Brennan, Joseph. "Gibb Songs: 1994". Retrieved 17 April 2013. ^ "Joseph Brennan – Gibb Songs: 2001". Columbia.edu. Retrieved 27 September 2014. ^ "Joseph Brennan – Gibb Songs: 2002". Columbia.edu. Retrieved 27 September 2014. ^ "Joseph Brennan – Gibb Songs: 2003". Columbia.edu. Retrieved 27 September 2014. ^ a b "Barry, Robin and Maurice's son Adam received the CBE award". Brothersgibb.org. 27 May 2004. Retrieved 2 June 2011. ^ "Joseph Brennan – Gibb Songs: 2005". Columbia.edu. Retrieved 27 September 2014. ^ "Joseph Brennan – Gibb Songs: 2006". Columbia.edu. Retrieved 27 September 2014. ^ "Being For The Benefit Of British Musicians". Stereogum.com. Retrieved 2 June 2011. ^ "Joseph Brennan – Gibb Songs: 2007". Columbia.edu. Retrieved 27 September 2014. ^ a b Rachael Bruce (10 July 2009). "Bee Gees named Freemen of the Borough". Isle of Man Today. Archived from the original on 28 May 2016. ^ BBC News (15 October 2009). "Bee Gees to perform on Strictly". Archived from the original on 18 October 2009. Retrieved 16 October 2009. ^ Brennan, Joseph. "Gibb Songs: 2010". Retrieved 17 April 2013. ^ Brennan, Joseph. "Gibb Songs: 2011". Retrieved 17 April 2013. ^ "Barry Gibb Performs his First U.S. Solo Concert at Hard Rock Live on 21 February". Hardrocklivehollywoodfl.com. 26 January 2012. Retrieved 16 April 2012. ^ "Gibb died from kidney, liver failure". Toronto Sun. Retrieved 10 March 2015. ^ "Barry Gibb to make debut at Grand Ole Opry – Celebrity Circuit". CBS News. Retrieved 23 September 2012. ^ Joseph Brennan. "Gibb Songs: 2012". ^ "Barry Gibb to Tour Starting in February". vintagevinylnews.com. Retrieved 23 September 2012. ^ "Barry Gibb hits the road with family's next generation – The Australian". Theaustralian.com. Retrieved 27 September 2014. ^ Brennan, Joseph. "Gibb Songs: 2013". Retrieved 17 April 2013. ^ "Brothers Gibb News 2013". GSI. Retrieved 29 December 2013. ^ Watkins, Gwynne (22 December 2013). "Paul McCartney Makes Merry With Fallon and Timberlake on 'SNL'". Rolling Stone. Retrieved 31 March 2015. ^ Shannon Carlin. "Watch Barry Gibb Perform with The Roots". News.radio.com. Archived from the original on 30 January 2014. Retrieved 29 January 2014. ^ Late Night with Jimmy Fallon. "Barry Gibb and Jimmy Fallon sings Everly Brothers songs". ^ CNN.com. "My World News – CNN – Barry Gibb interview". Archived from the original on 2 February 2014. ^ a b Jefferies, Mark (11 July 2014). "Bee Gees singer Barry Gibb says he wants to die on stage while singing iconic hit Stayin' Alive". Mirror. Retrieved 10 March 2015. ^ theartofmccartney.com. "BARRY GIBB – The Art of McCartney". Retrieved 22 February 2015. ^ James, Gary. "Gary James' Interview With T.G. Sheppard". classicbands.com. Retrieved 31 March 2015. ^ Olivier, Bobby (8 February 2015). "2015 Grammy Awards: Live updates, winners and notes from music's big night". Retrieved 22 February 2015. ^ "Bocelli, Estefan, Flo Rida headline Hard Rock Rising Miami Beach". southflorida.com. Retrieved 31 March 2015. ^ "Miami Beach centennial concert rocks the crowd". Miami Herald. 26 March 2015. Retrieved 31 March 2015. ^ "Barry Gibb at Hard Rock Global Music Festival, Miami Beach, FL, USA". Setlist.fm. Retrieved 31 March 2015. ^ "Coldplay close Glastonbury 2016, with help from the Bee Gees". BBC. 28 June 2016. ^ a b "Legendary Singer/Songwriter/Producer Barry Gibb Signs To Columbia Records". Prnewswire.com. Retrieved 7 October 2016. ^ "Columbia Records Announces Legendary Singer/Songwriter/Producer Barry Gibb To Release First Solo". Prnewswire.com. Retrieved 7 October 2016. ^ "Barry Gibb brings Glastonbury to its feet". BBC. 25 June 2017. ^ "Looks like Coldplay might be joined by a Bee Gees legend at Glastonbury". The Independent. 25 March 2016. Retrieved 13 November 2017. ^ "The Bee Gees". The Telegraph Herald. 22 July 1979. Retrieved 19 January 2013. ^ "Barry Gibb of the Bee Gees: 'I want to keep the music alive'". The Guardian. 13 March 2014. Retrieved 7 October 2016. ^ "Michael Jackson & The Jackson 5 Rock and Roll Hall of Fame 1997". YouTube. Retrieved 18 February 2019. ^ "Gibb buys Johnny Cash's house". USA Today. 5 January 2006. Retrieved 15 April 2007. ^ "Johnny Cash's Former Home Burns to Ground". Archived from the original on 2 May 2007. Retrieved 10 April 2007. ^ "The worst part of losing my brothers? We weren't even friends at the end: In a soul-baring confession, Barry Gibb tells of the guilt, remorse and loneliness of being the last of the Bee Gees". Mail Online. Retrieved 27 September 2014. ^ Davies, Hugh (11 January 2003). "Bee Gee Maurice critically ill after surgery". The Daily Telegraph. London. Retrieved 24 February 2015. ^ "BARRY LEVINE: Mills Brothers one of numerous brother acts to find success in the music business". albanyherald.com. Retrieved 11 March 2015. ^ "Bee Gee Robin Gibb Dies Of Cancer At 62". npr.org. Retrieved 11 March 2015. ^ Hall, Mark. (director) In Dreams: The Roy Orbison Story, Nashmount Productions Inc., 1999. ^ "Frankie Valli – 100 Greatest Singers". Rolling Stone. Retrieved 20 February 2015. ^ "The Bee Gees' Barry Gibb: "Country Music Always Inspired Us"". Country Weekly. 4 November 2013. Archived from the original on 4 March 2016. ^ "Q magazine's 100 Greatest Singers". empireonline.com. Archived from the original on 2 April 2015. Retrieved 10 March 2015. ^ "The Bee Gees biography". Rock and Roll Hall of Fame and Museum. 1997. Retrieved 25 October 2010. ^ "Hot 100 turns 60". billboard.com. Retrieved 11 August 2018. ^ "John Farnham tops the list of Australia's greatest singers of all time". news.com.au. Retrieved 10 March 2015. ^ Campbell, Al. "You Don't Have to Say You Love Me/I Don't Know How to Love Her – Jerry Vale". AllMusic. Rovi Corporation. Retrieved 24 February 2015. ^ "Barry Gibb Chart History". Official Charts Company. Retrieved 22 February 2015. ^ a b c d e f "Barry Gibb Chart history". Billboard. Retrieved 17 February 2015. ^ a b c d "Barbra Streisand & Barry Gibb Top Songs". musicvf.com. Retrieved 10 March 2015. ^ "The Gibb brothers discography". officialcharts.com. Retrieved 12 March 2015. ^ "Barry Gibb Songs Discography". Dutch Charts. Archived from the original on 26 April 2015. Retrieved 12 March 2015.